Some people are simply more laid-back and chill than others, and have a natural way of letting things go and just living in the present. These people seem to live without a care in the world, while others find it much more difficult to be relaxed about things. 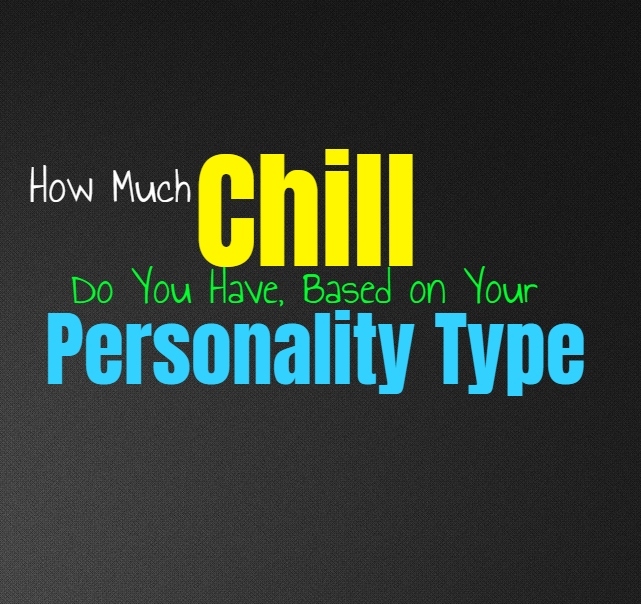 Here is how much you have, based on your personality type. INFJs don’t usually have all that much chill, at least not when they are surrounded by others and having to deal with day to day life. INFJs do have the ability to be more laid back, but it depends entirely on the circumstances. They have so much inside of their minds all of the time and they can become a bit overwhelmed because of this. They overthink and have such complex thoughts and feelings, and because of this it can be challenging for the INFJ to just sit back and feel chilled out. ENFJs don’t really have much chill, especially since they are always so focused on taking care of others. The fact that they have so much pressure on their shoulders all of the time makes it difficult for them to really relax. ENFJs can become overwhelmed by their desire to care for those around them, constantly thinking about all of the things they need to get done. It really isn’t easy for the ENFJ to feel chill, since they almost always feel like there is something they should be doing in that situation. INFPs can seem like laid back people sometimes, but they do often have a lot going on inside of their minds. They can sometimes over-analyze situations and this can make it hard for them to really feel a sense of relaxation. INFPs have such rich and complex thoughts and feelings, and this makes it more challenging to have a strong sense of chill in their personality. They want to be able to just let things go and move on, but their minds seem to always be thinking about different ideas and sometimes these things make it hard for them to really relax much. ENFPs are the type of people who often appear to have a lot more chill than they actually do. They come across as being very laid back and just lighthearted people. In truth ENFPs have a lot going on inside of their minds, and sometimes this can be more overwhelming than people realize. All of these complex thoughts can make it so that the inside of their minds are somewhat anxious and stressful places to be, but on the outside people won’t notice or recognize this about them. INTJs don’t really have much chill, simply because their minds don’t allow for this most of the time. They might seem much more relaxed than they actually are, since their inner minds are filled with so much complex thought and imagination. They are always striving for improvement and never want to just settle for less than what they know they can achieve. This makes it hard for them to have a whole lot of “chill” since the INTJ is more focused on progress and growth than a sense of relaxation. ENTJs don’t usually have all that much chill, since they are such focused and determined people. They have so many goals in mind and they want to be able to achieve them. They would rather focus on getting the job done than take time to relax, since relaxation can actually be more stressful for them. ENTJs don’t have much chill and they are perfectly fine with that, since they are focused more on growth and achieving the things they want out of life. INTPs do sometimes appear to have more chill than they actually do, since their outward demeanor can seem cold and reserved. INTPs don’t show emotions easily or naturally, and so most people don’t recognize when they are stressed or overwhelmed. INTPs do try not to hold onto things which are draining or pointless, but they have extremely active inner minds which makes it hard for them to really remain chill. Inside their minds is often filled with analysis and sometimes overthinking to the point of stress and anxiety. ENTPs are capable of being chill when they feel the need for it, but they do have rather overactive inner minds. They spend so much time processing information and analyzing it, that they can sometimes be more high strung than people realize. ENTPs try to focus on enjoying themselves when they need to, and they don’t like allowing themselves to become too stressed out about a situation when they really should be chill. ISTJs really don’t have much chill, since they are more interested in being efficient and getting things done. For them it is important to work hard and achieve their goals, and so they don’t want to waste their energy trying to seem cool or laid back. ISTJs are focused on always improving and so sometimes this can leave them feeling a bit stressed and high strung about things. ISTJs don’t want to just sit back while they should be working hard to get something finished, and so they don’t always seem to have a lot of “chill”. ESTJs are hardworking people who don’t like leaving anything up to chance. They don’t want to fall behind because they have become relaxed about something, and so ESTJs push themselves to always be focused on what matters to them. They don’t always seem to have much chill, and actually be somewhat high strung or even stressed people. This is simply because they don’t like taking chances and would much rather push themselves to achieve the goals which matter most to them. ISFJs don’t usually appear to have much chill, since they are always so focused on being responsible and getting things done. ISFJs can seem a bit stressed out when they are trying to get something taken care of, and they often have so many responsibilities which are placed on them. ISFJs provide for their loved ones and are deeply concerned with being able to make them happy and comfortable. Because of their desire to care for everyone else the ISFJ can sometimes lack a sense of chill, and may not have the most relaxed natures. ESFJs usually don’t have much chill, since they can become so focused on being able to take care of others. They can sometimes seem more stressed and high strung than they like, since they don’t want to do anything which might disappoint those around them. All of this pressure and responsibility to take care of others can make it challenging for them to really take time to relax. They don’t usually appear to have much chill, but this is because they can become so overwhelmed with the fact that they take care of everyone around them. ISTPs do actually appear to have some chill, since they are more laid back people. They don’t like obsessing over things or getting themselves worked up over something they cannot really change. For the ISTP it is more rewarding to take life as it comes and just allow themselves to live in the moment. For them it is more rewarding to take chances and just experience life, and sometimes this means leaving behind responsibilities which stress them out. ESTPs do seem to have more chill than some other personality types, especially when they are focused on living in the present. The ESTP who isn’t obsessing over things and is just living in the moment, is actually a truly fun and vibrant person. They want to be able to enjoy themselves and don’t want to get too hung up anything which will bring them down or leave them feeling overwhelmed by their circumstances. ISFPs do have quite a bit of chill most of the time, and can be seen as very laid back people. They are free spirits who want to enjoy living in the moment and don’t want to feel restrained by doubt or responsibility. Sometimes the ISFP will leave behind the things which stress them and simply seek out whichever will bring them the most joy. For the ISFP it is important to really experience life on their own terms, and follow their heart without letting stress take them over. ESFPs actually do seem to have a lot of chill, especially when they are focused on living in the present. ESFPs enjoy seeking out things which excite and fulfill them, and don’t like being held back by responsibility. For them it is more rewarding to just experience life as it comes, and always seek out new and exciting things. They aren’t the type of people who enjoy letting life stress them out or hold them back, and so they actually have a lot more chill than most other personality types.